The Dainese D-System D-Dry jacket is unique in that it features a more extensive venting system than most other jackets of this type, but the D-Dry liner acts as the water- and wind-resistant barrier. It's surprisingly warm and comfortable even in colder weather. 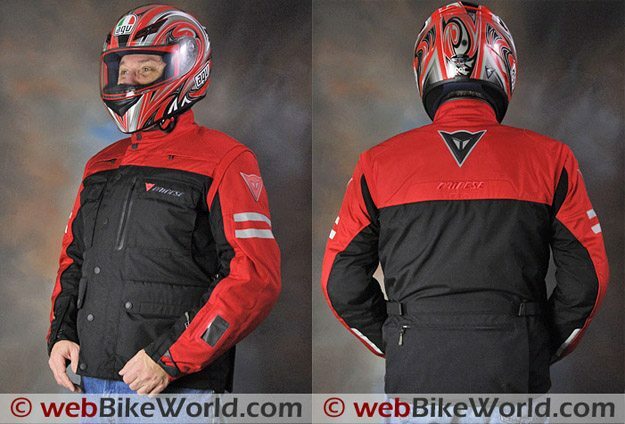 This could easily work as a four-season jacket in all but extreme climates and with the addition of a Dainese back protector, the owner could have a single jacket that may well meet all requirements and should provide long-term service. Very nice styling and design. Excellent wind blocking. Comfortable and snug fit. CE-approved armor. Availability of back protectors to fit. Excellent ventilation. Some loose threads and ends. Non-adjustable collar on jacket and liner. Minimal adjustment on sleeve cuffs. Sleeve cuffs slightly bulky. Slightly biased to moderate temperature wear. Classic styling, excellent construction, unique D-Dry liner and probably the best venting of any non-mesh 3/4-length jacket I’ve tried makes the D-System D-Dry jacket a four-season standout. 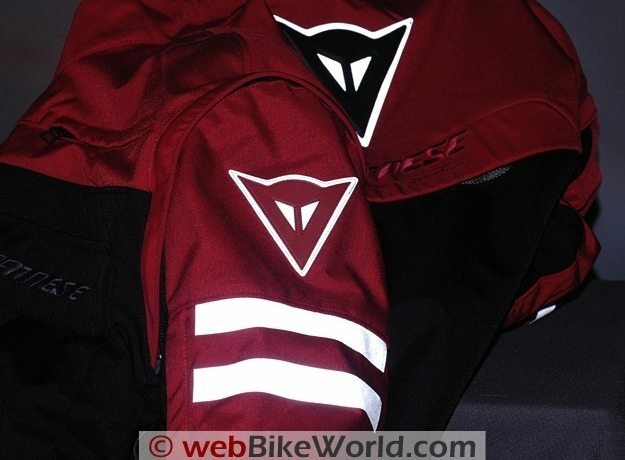 Search webBikeWorld for the keyword “Dainese” and you’ll find just three articles featuring that storied brand. 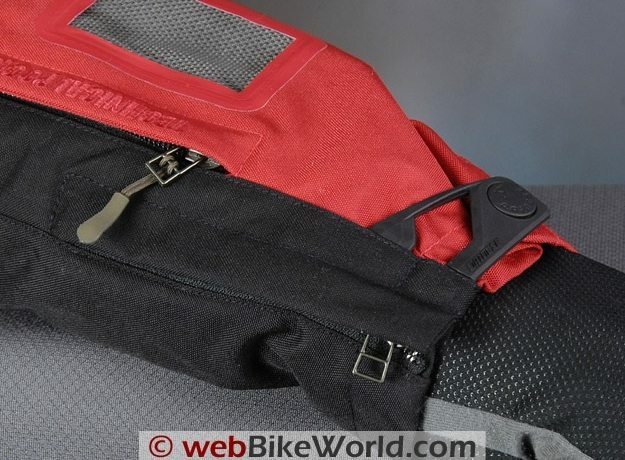 And if that isn’t sad enough, two are edited press releases and only one is an actual webBikeWorld review of a Dainese product: the Jet Stream Tourer helmet, published in February of 2007. Pretty pathetic, eh? As the Editor, my weak excuse is…well, I don’t really have an excuse, I’ll admit. That’s going to change, with the improved distribution of Dainese products in the U.S. and a direct source for Dainese motorcycle gear through our affiliate at RevZilla, we hope to feature many more Dainese reviews in 2010. Come to think of it, that sounds like a New Year’s resolution, no? Also, Dainese owns AGV, and AGV S.p.A. (AGV Italy) sells helmets directly to Parts Unlimited for distribution in the U.S.A. We also learned that AGV is no relation to AGV Sport, despite the alliteration of the appellation. webBikeWorld visitors from around the world have been clamoring for more Dainese and AGV reviews, so this is good news all around. Speaking of which, we also have an AGV K3 helmet review in the works, so stay tuned. A browse through the Dainese product list is a mind-boggling experience, that’s for sure. Literally hundreds of products to choose from makes for a wonderful way to kill 3+ hours or so on a rainy (or snowy) afternoon. 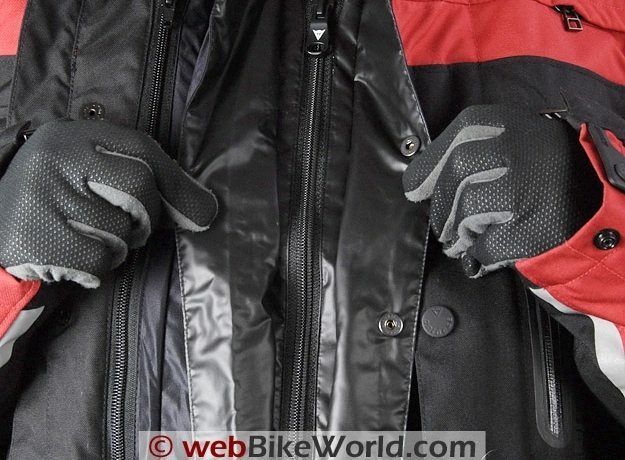 It was a tough decision, but from the entire catalog, we decided to go with a classic for this year-ending webBikeWorld review: the Dainese D-System D-Dry jacket. And out of the hundreds of motorcycle products, there are dozens of jackets, so choosing one can be tough. 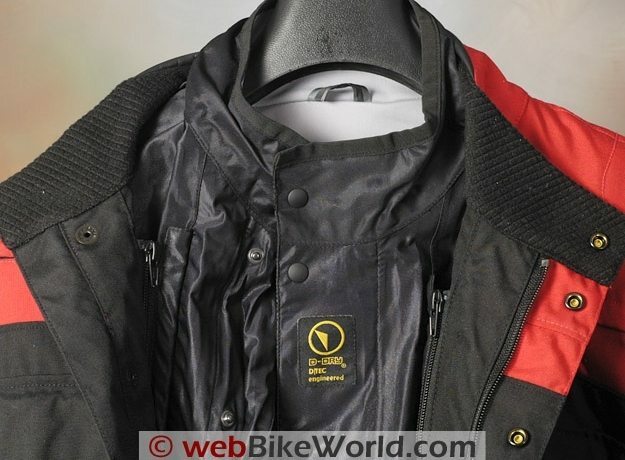 Some of them are priced lower and some priced much higher than the D-System D-Dry jacket shown here. There are jackets made from textile, leather and various combinations and all of them have curious-sounding names like the Gator Evo Gore-Tex; the Nector Gore-Tex; the Rapture Pelle (as compared to the Lucky Pelle, Vintage Pelle, Imatra Pelle Pro and the SF Pelle); the Zurigo and many more. Sound confusing? It can be. Search for a combination of “Male”, “Touring” and “Jackets” and you’ll find 6 screens, each with 12 jacket choices. 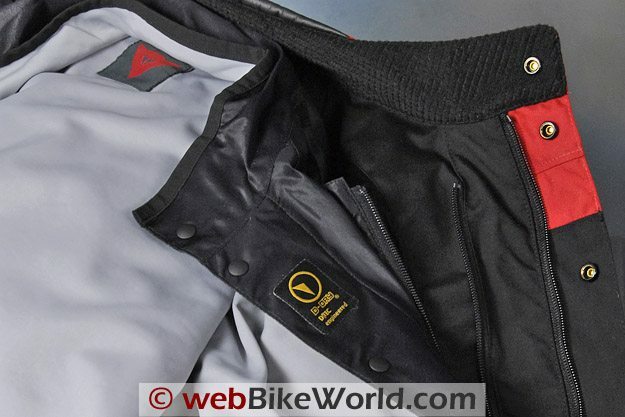 But in the end, the Dainese D-System D-Dry jacket was chosen for a couple of reasons. First, it’s probably the most representative of the Dainese 3/4-length jacket lineup, with all the features we’ve come to expect from a 3/4-length jacket. It also has a more reasonable price than, say, the $1,299.00 “Monotone” (that’s what they call it) jacket. It’s also similar to some of the other types of water-resistant, 3/4-length jackets we’ve reviewed, so comparisons can be made. Finally, the D-System D-Dry jacket is new for 2010, which means that it incorporates the latest and greatest technology from the Dainese labs. And the D-System D-Dry jacket definitely has a few unique features that distinguish it from the crowd, so let’s take a look. It’s not clear what the “D-System” terminology means in the extensive library of Dainese technical language (they actually have a “D-pedia” that explains it all) but “D-Dry” refers to the special liner used in this jacket. It’s probably best to start by describing all of these “D-” items, as they rather define the philosophy behind this particular apparel item. I’ll have to guess that the term “D-System” refers to the “system” capabilities of the jacket, with its removable arms, which I’ll describe in a minute. The D-Dry liner feels different than other “waterproof” (i.e., what we call water-resistant) liners in similar jackets covered in this review series. The D-Dry liner is removable and it acts as the water-resistant barrier for the rider. The outer shell of the jacket appears to be made from a Cordura-like material. 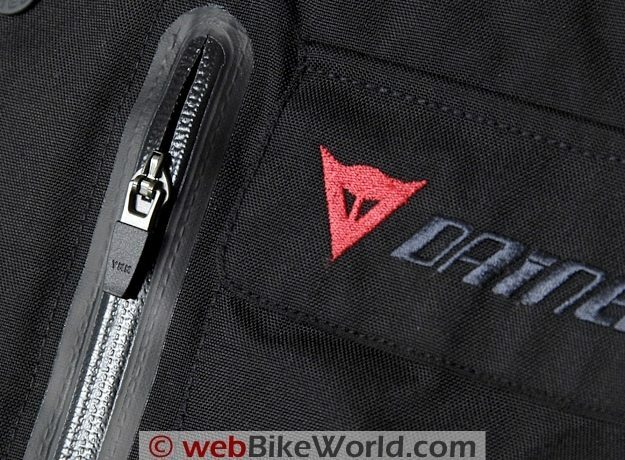 Dainese doesn’t indicate which type of material is actually used, but it has the look and feel of a 500 or so Denier Cordura, commonly used on motorcycle jackets. The liner attaches to the jacket with separate zippers on either side of the front placket, along with a snap at the back of the neck and, surprisingly, only one snap at the sleeve cuff. The single snap to hold the sleeve cuff means that the liner feels like it’s coming out with my arm when I take the jacket off. It doesn’t, but I’d prefer a second snap or a zipper at the cuff to keep the liner securely positioned. The D-Dry liner has a very soft and comfortable inner fabric sewn to the inside, attached in a way that does not compromise the water integrity of the shell with through stitches. The outer fabric of the D-Dry liner is a bit different than typical, with a softer feeling material than is usually found in this type of water-resistant lining. What this means is that the D-System D-Dry jacket shell will absorb water in a rainstorm and the liner will (hopefully) prevent the water from reaching the rider. 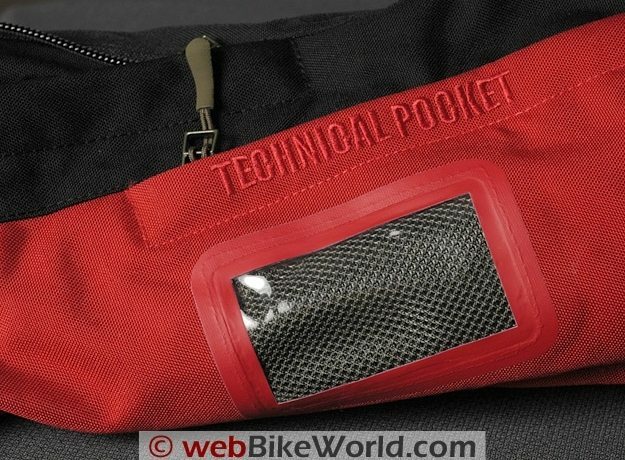 Many webBikeWorld readers have questioned this type of system, but there really isn’t a truly waterproof outer shell that will also breathe the way the outer shell/inner liner system does. Indeed, this “system” is one of the most distinguishing features of the D-System D-Dry jacket. This is one 3/4-length jacket that should work for all four seasons. The special D-Dry fabric is pretty high-tech stuff, which was apparently developed by the “D-Tec” subsidiary of Dainese, which, by the way, is also said to be working with NASA on space suit material designed for a Martian adventure. Dainese is one of the few motorcycle clothing manufacturers to test their water-resistant liners using standard laboratory methods, so the system should be about as water-resistant as they come. We did not get a chance to evaluate this because the fast onset of winter and the snowstorm of the decade (21″ deep and, so far, the snowstorm of the Century) means no rain to ride in. An indoor evaluation using various combinations of water pressure does indicate that the D-System D-Dry jacket shell does repel quite a bit of water, leaving us unsure of how much rain it would take to actually soak the outer liner. The D-Dry liner also was water repellent in our evolutions and one thing’s for certain — the liner breathes like no other. The jacket also has an outstanding ventilation system, but not all of the zippers and vents are water-resistant (i.e., “waterproof”) and, in fact, the sleeves are open underneath for ventilation — all the more reason why a good water-resistant liner is important. I’ll get into all of this in the next sections. 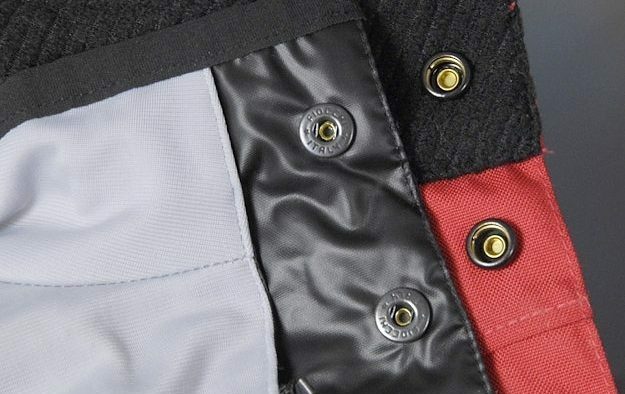 The D-System D-Dry jacket is very well made, with high-quality seams and obvious care in the construction. Features like rubber-covered metal snaps and Fiocchi Prym metal spring snaps in the liner do make a difference. This example did have a few loose thread ends hanging here and there which were quickly addressed with a pair of scissors, but otherwise the quality is excellent. 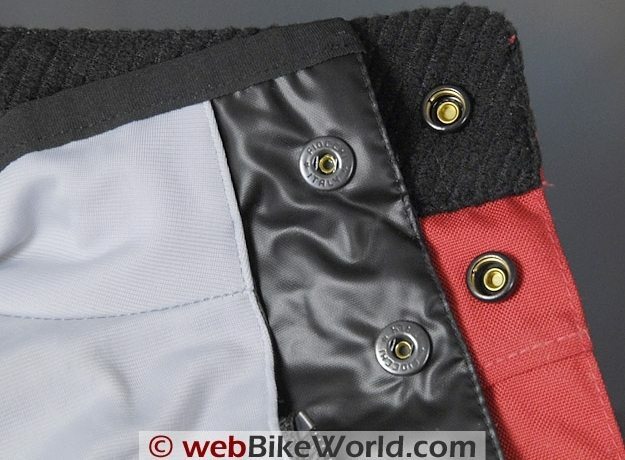 Shell and Liner Conclusion: The bottom line here is that the design and construction of the D-System D-Dry jacket makes it unique in the 3/4-length motorcycle jacket category. The D-System D-Dry jacket features an extensive venting system that is about as good as it gets without using mesh panels. 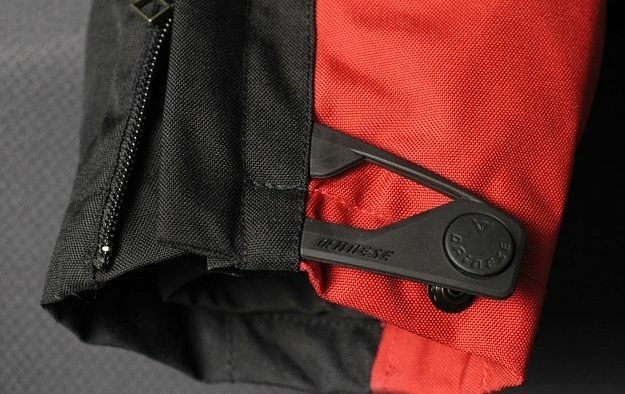 The most interesting feature is the open vent under the arms — something that has been standard on the Aerostich Darien jacket for many years and for some reason not copied by other manufacturers. It’s curious to note that as implemented on the D-System D-Dry jacket however, the underarm vent is always open for business. It does not close, but instead is hemmed with a wide section of elastic fabric that doesn’t really cover it completely. The sleeves on the jacket are removable; a feature we’ve seen on a few other jackets. But I’m not sure how many riders actually remove the arms and the armor underneath, so this capability doesn’t really excite us very much. It is possible to partially unzip the zipper to allow more ventilation if desired. With the D-Dry liner installed, the air only circulates out the pair of rear vents at the top of the back, which are also permanently open but covered by a flap. With the D-Dry liner removed, the low-pressure area around the rear vents helps pull the air through the jacket from under the sleeves without billowing the shell. An always-open vent under the arms may seem strange for a four-season jacket, but to be honest, I didn’t even notice the vents until I happened upon them after riding in some colder temperatures. So the D-Dry liner apparently helps isolate the cold air coming through the jacket. It’s also important to note that this jacket does not have an insulating liner. But this was another feature I didn’t know was missing when riding in 45 degree F weather. It’s actually surprising that the jacket can work so well in colder temperatures with both the open underarm vents and no thermal liner, but it does. Besides the underarm vents, the jacket features horizontal vents on either side of the upper chest. These are simple vents that open with a non-water-resistant zipper. Each arm has a huge vent zipper that opens from just above the wrist to the upper arm. I have not opened these vents because the weather is just too cold, but I think they will work very nicely in warmer weather. 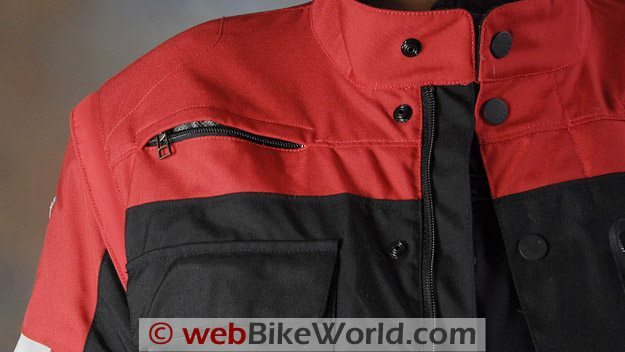 The jacket also has short zippered vents in the midsection under each arm. These zippers and the arm vent zippers have a long attached zipper pull for ease of use. The water-resistant vertical zipper seen in the photos on the right-hand side of the chest covers a water-resistant pocket that’s a handy storage location for a wallet or cell phone. Vents and Zippers Conclusion: The D-System D-Dry jacket has a unique and useful venting system that should make this jacket about as versatile as they come for four-season use while remaining resistant to water and useful in the winter. 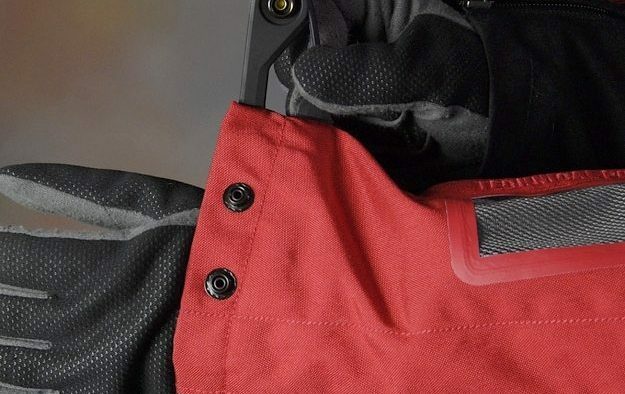 Underarm vent on the D-System D-Dry jacket is always open for business. D-Dry liner has a very soft gray-colored inner fabric. The jacket is listed under U.S. sizing in North America, but the sizes are converted from the European scale in which the jacket is produced. This one is a Euro size 54 and it fits very close to the U.S. size 44 that is shown on the Dainese size charts. I hedged back and forth between a 54 and 56 because, like just about every other piece of motorcycle apparel, I’m in-between sizes. But I’m glad I ended up with the size 54, which is just a touch on the snug side for me, because with the liner removed and only a T-shirt or light turtleneck underneath, the jacket fits perfectly for warm-weather use. I think this D-System D-Dry jacket in size 44 should fit perhaps a 42.5 to a 44 U.S. men’s chest with 34″ sleeve length (street clothes), but I think anyone over a size 44 would probably be better off with the 56 Euro. For my in-between size (U.S. men’s 43″ chest, 34″ sleeves and medium build), if I was going to bias the jacket for warm weather, I’d buy the 54 and if I was biased towards colder weather use, I’d buy the 56, which would allow the use of a sweater or heated vest underneath. The jacket also has a pair of easy-to-use waist adjusters, which allow the jacket to be tightened at the waist for a better fit and to help block any air that may try to come up from underneath. Jacket Sizing Conclusion: The D-System D-Dry jacket appears to run true to the Dainese size charts to maybe just a touch small. External: The jacket has what could be considered as the basic arrangement for a 3/4-length jacket, with two large square front lower pockets and two square chest pockets also in the front. The lower pockets close with two large snaps only. The actual opening for the pocket is folded over so that it sits upside-down when the pocket flap is closed. 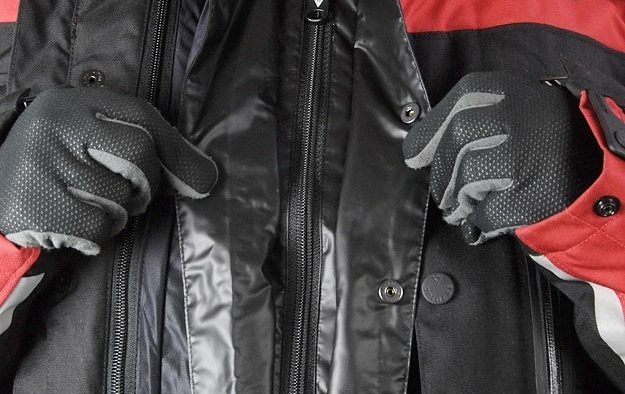 This is a simple arrangement that works, because it avoids having to fuss with a zipper or Velcro when wearing gloves. 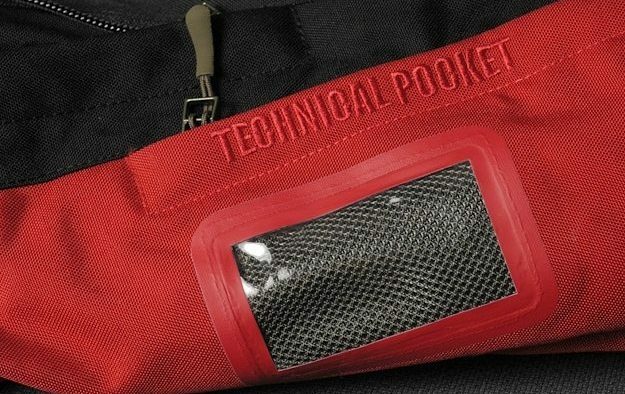 These pockets appear to be water-resistant and are lined with a soft light-gray material that feels similar to the inside of the D-Dry liner. The upper chest pockets close with both Velcro and a single snap towards the arm side of the pocket and they close tight. They also appear to have a water-resistant lining. These pockets are more difficult to open when wearing gloves because they really don’t have a tab to grab on to. The jacket also has a horizontal pocket in the rear, but we couldn’t find a way to stuff (or over-stuff) the pocket with the sleeves and shoulder armor if removed. One or the other perhaps, but not both. 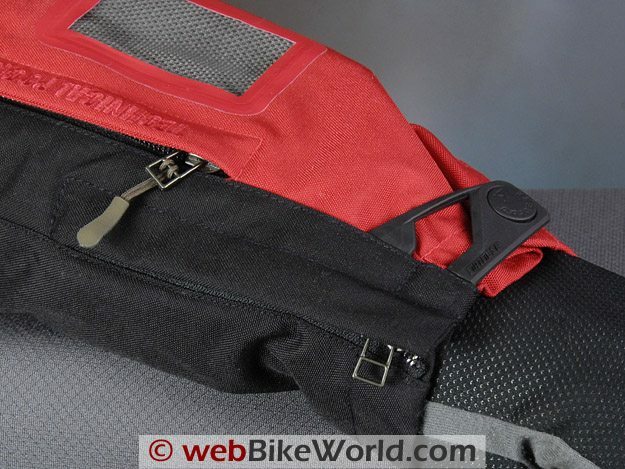 However, the removable D-Dry liner does fit nicely inside the rear pocket. 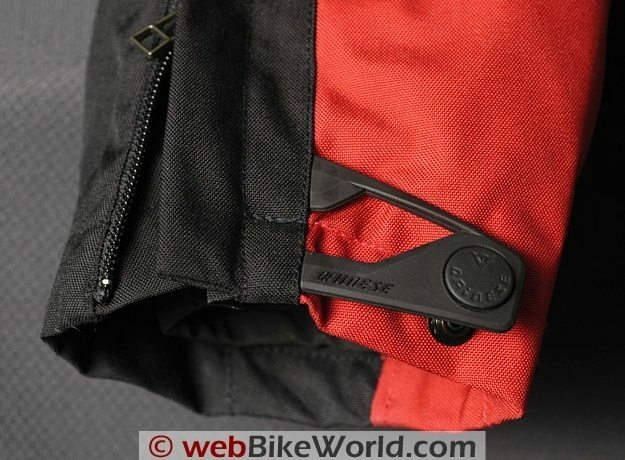 The rear pocket is also covered with a full-length, non-water-resistant zipper with a long zipper pull. The pocket appears to have a water-resistant lining however. The left sleeve has a clear vinyl covered “Technical Pocket”, accessible through a smaller zipper inside the left arm vent zipper. This pocket can be used to hold an ID card or possibly an electronic toll pass (or money). The pocket has a 100 mm wide entry and it’s 80 mm deep. Internal: The liner has a horizontal zippered pocket on the lower right-hand side, which is an unusual location for an internal pocket but welcome nonetheless. The liner also has the standard horizontal zippered pocket on the left-hand side at the upper chest. Both pockets are relatively deep and wide. The jacket shell features a horizontal zippered pocket on the left-hand chest. 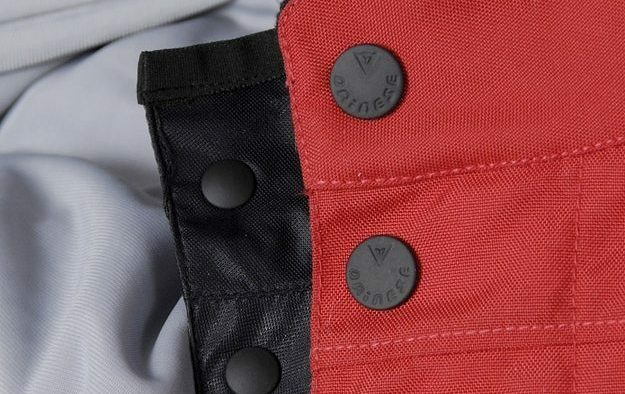 There is no vertical pocket inside the placket, but the outer vertical pocket serves this purpose and allows access to a wallet or cell phone without having to unzip the jacket. Pockets Conclusion: The lower pockets are easy to use when wearing gloves and the internal pockets with zippers are handy and welcome. Logos and stripes are highly reflective. The D-System D-Dry jacket does not have an insulating liner but the system as described above seems to provide better than expected comfort in colder temperatures. 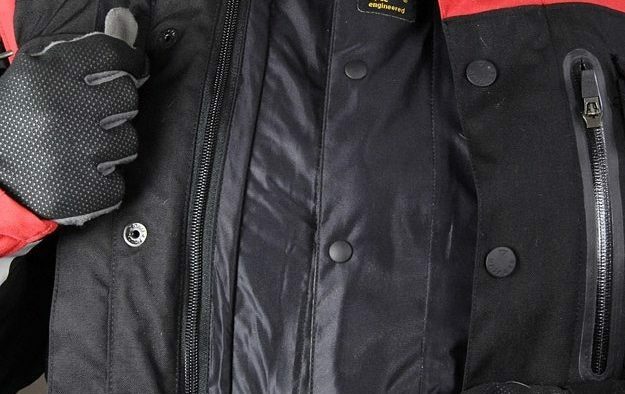 The D-System D-Dry jacket comes with CE-approved removable elbow and shoulder armor. The elbow armor has longer coverage than normally found but the shoulder armor is about average. These are specially designed Dainese inserts that feel like they will offer a high level of protection. 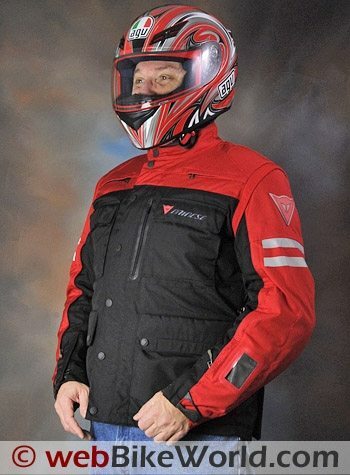 The jacket has a pocket in the back that will fit several versions of Dainese back protectors, such as the G1 or G2 Air Shield, but these are optional and the jacket does not come with a back protector or padding. Since this jacket is a “keeper” that should serve the owner for a long time, it is recommended that a back protector is purchased with the jacket. Sleeve cuff has a large cinch with only two snaps but also features a zipper for ease of entry. 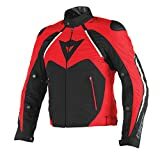 The jacket is comfortable when riding, helped by the outer shell material, which feels softer than the material traditionally used for motorcycle jacket shells. The armor is well designed and does not interfere with arm movement, yet the slightly snug fit keeps the armor in place where it belongs. The shell does not include additional external abrasion-resistant material, so I’ll have to assume that the shell fabric is designed to serve this function. 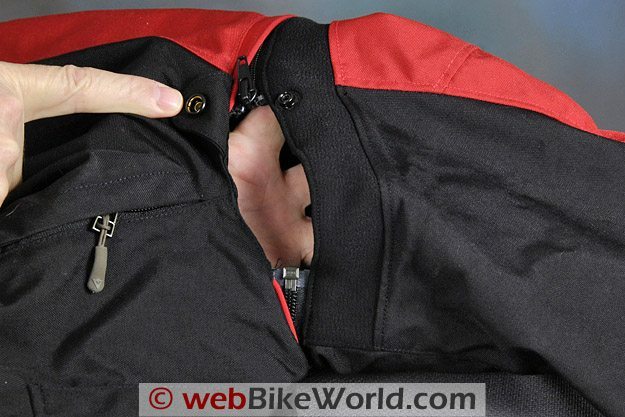 The absence of additional abrasion-resistant material is becoming more commonplace on motorcycle jackets, discussed in the Firstgear Teton jacket review which was also covered in this 2009 “waterproof” jacket review series. The D-System D-Dry jacket feels slightly shorter than average for a 3/4-length jacket, which helps to keep it comfortable in a variety of riding positions. The jacket does not have an adjustable arm cinch strap system and I don’t miss these at all. The arms are snug without feeling restrictive and the overall design and the cut of the fabric feels like it will keep the armor in place. Overall, the jacket is very comfortable and its form-fitting shape is flexible enough to protect the rider without feeling too restrictive. 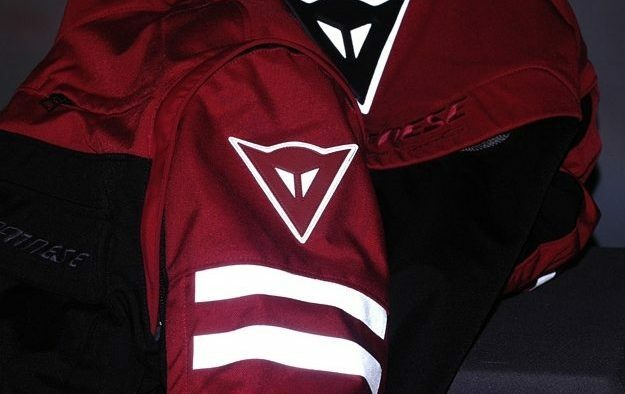 Reflective logos on the Dainese D-System D-Dry Jacket. 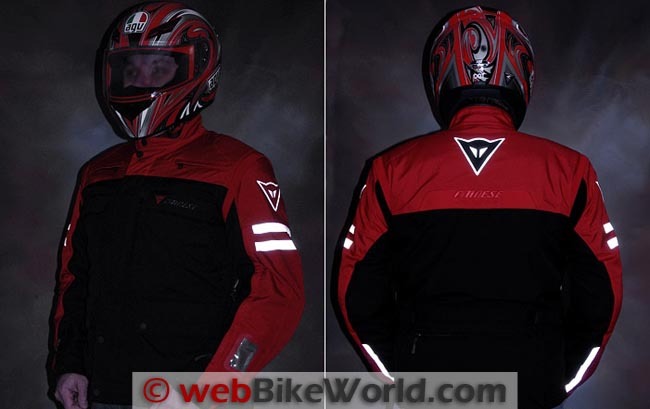 The jacket has a pair of highly reflective strips on either sleeve, along the lower sides and behind the Dainese Fox head logo on the sleeves and the rear of the jacket. 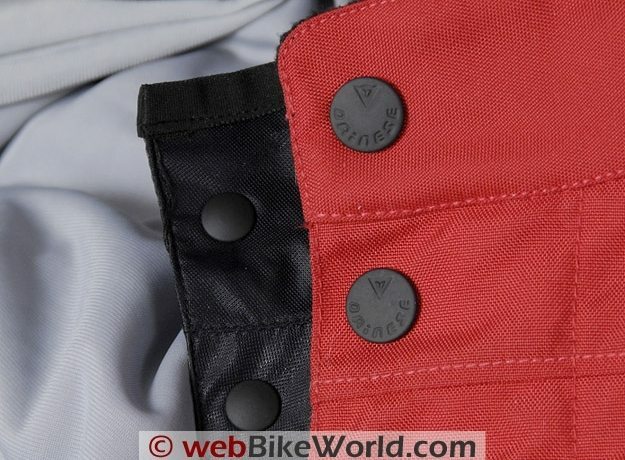 Attachment Zipper: The jacket also has an internal 8″ zipper on a piece of stretch fabric, which allows it to be attached to other Dainese brand pants. Dainese does offer a matching pair of D-System D-Dry pants designed for this jacket. Stitching: Most of the seams are single-stitched. The material used for the stitching is unknown and it is mostly external. The stitches are straight and indicate high quality. The overall design of the jacket has apparently minimized the number of seams and the jacket has a relatively streamlined appearance. Sleeve Cuffs: The sleeve cuffs have a vertical zipper plus a two-position snap feature. The outer attachment for the snaps is slightly large and I think this makes the cuff diameter slightly larger than normal, so the sleeve cuffs can’t be cinched up as tightly as they could be if Velcro or some other system were used. Neck: The neck has two snaps but no adjustment, which is surprising and may also be problematic for some. It would appear that both in the neck and the sleeve cuffs that fashion or style took some precedence over function. There’s some extra room in the cuffs over my 7.25″ wrists and the neck is slightly tight on my admittedly large 17″ neck. The stand-up collar on the D-Dry liner has its own snap and the lack of adjustment on the outer collar of the shell just fit me with no room to spare for a turtleneck underneath. This may not be a problem for owners with narrower diameter necks, but the opposite problem may also occur, where those with narrow necks may find the collar too loose. Comparison: Without a lot of experience in the entire Dainese jacket lineup, it’s difficult to make a comparison. But I’d say that the D-System D-Dry jacket is a close competitor to the Rev’it Off-Track jacket (review), which is soon to be replaced by the Rev’it Sand jacket for 2010. Both jackets are priced identically and both feature unique venting systems. The Off-Track jacket uses more mesh and has removable mesh panels. It would be a very difficult choice, which may come down to availability and current sale pricing. Very nice styling and design. Availability of back protectors to fit. Some loose threads and ends. Non-adjustable collar on jacket and liner. Minimal adjustment on sleeve cuffs. Slightly biased to moderate temperature wear. The Dainese D-System D-Dry jacket is unique in that it features a more extensive venting system than most other jackets of this type, but the D-Dry liner acts as the water- and wind-resistant barrier. It’s surprisingly warm and comfortable even in colder weather, especially considering that it does not have an insulating liner. The D-Dry liner also feels like it has excellent breathing capabilities. 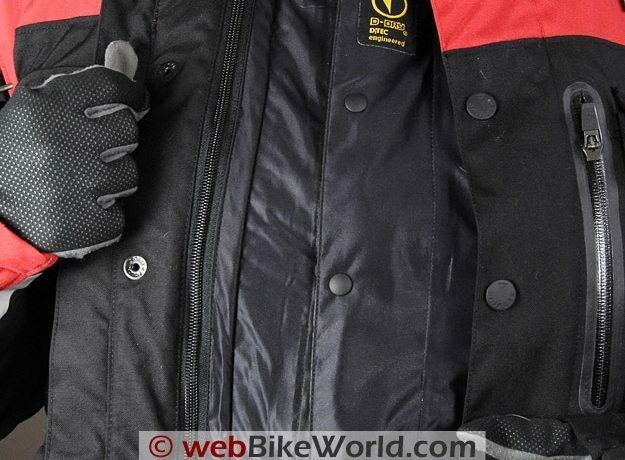 This could easily work as a four-season jacket in all but extreme climates and with the addition of a Dainese back protector, the owner could have a single jacket that may well meet all requirements and should provide long-term service. 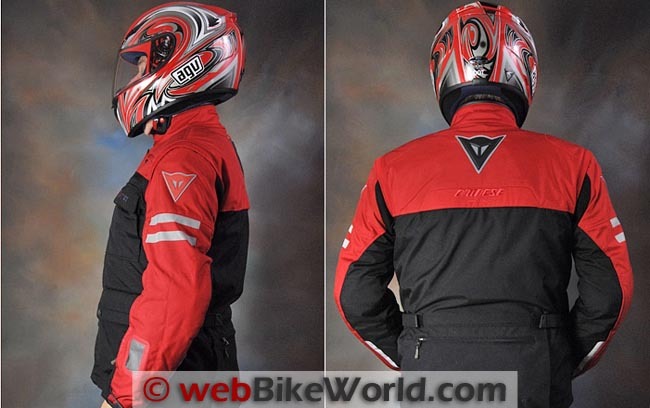 Available From: Dainese List Price: $549.00 (Currently $549.00 at RevZilla with free shipping). Colors: Black, Red, Anthracite and Green. From “M.P.” (03/11): “I just wanted to say that your review of the jacket was excellent and very welcomed. I think it would be very good to mention that the liner material (Grey) on the inside of the D-Dry is new for Dainese and very soft…so the way the jacket feels on a rider will be much more comfortable than that of past Dainese D-Dry jackets. From “B” (1/10): “I always respect the quality of your reviews so was very interested to read the (D-System D-Dry review) one as initial reports of the jacket had me seeking out one earlier last year. Dainese kit has always fitted me very well and user experience with their Gore-Tex textiles has made me a fan of their garments. This has been helped by having a Dainese Pro-Shop in close vicinity to my location in the UK. As a rider of an adventure style bike (KTM 990) the D-Dry Jacket, on paper, was exactly what I have been after. On trying on the jacket though I was immediately struck by the incomplete closure round the arms where they zip to the body of the garment. This is unlike the BMW Rallye Jacket where the zipper goes right around. Given the upright riding position on the KTM I was very concerned about the wind and possibly rain channeling through the gap and rather than gamble and spend £250+ decided to shy away. The shop owner said they use a similar principle on Dainese sport style textiles and he’d had no complaints but obviously wasn’t prepared to offer a “sale or return” on the D-Dry. I was concerned that on a warm day ride without the liner as the temperature dropped, say in the evening, the cooler air would channel in making the rider cold, forcing a stop to install the liner. In wet weather would rain again channel through the gap chilling the rider and compromising the effectiveness of the liner? Too many questions to gamble on a purchase I felt! Since then your comprehensive review of the jacket is the first I have come across and seems to suggest the closure under the arm in not an issue. I am intrigued to know, in the main, what your riding position is with the jacket; it would be good to know who else out there has bought this jacket and if they have any comments on the arm closure. I doubt you can throw any more light on my concerns but hopefully you can understand them and agree they raise an interesting discussion point! Editor’s Reply: I believe you are referring to the gap under the arms? Yes, this is a bit different, but so far not a problem and my feeling is that the ventilation it offers for summer use seems worth any potential tradeoff, for my riding conditions anyway. Wearing the liner underneath keeps the rain out. It’s possible I suppose that if it got cold at night after riding during the day with the liner removed that the gap might be a problem, but doesn’t appear to be on any of the bikes I ride when wearing it, including the Multistrada. There may be a tiny percentage of day/night riding when this might happen, but every jacket has a compromise, and I guess this is one of them. 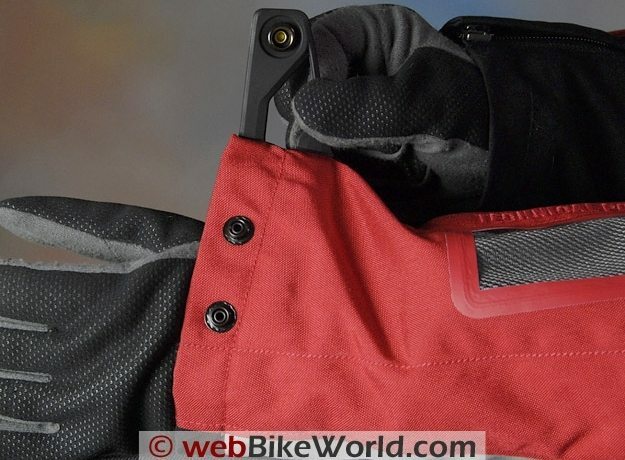 The opening does offer better ventilation than most of the other 3/4-length non-mesh jackets we’ve tried and many riders in hot-weather climates would appreciate this. 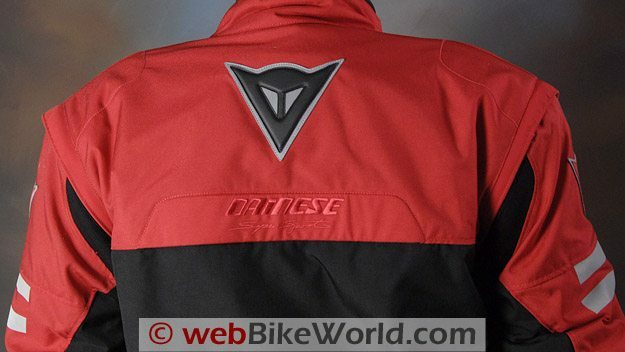 Dainese has many other jacket styles available as mentioned in the review, so perhaps there are others that better fit your riding conditions. From “I.B.” (12/09): “Just read the review and would like to make a general comment on textile clothing using the “waterproof layer” system. I’ve been riding for 40+ years all over Europe and have had many textile jackets and trousers. Dry liners are the one type I’ve used once and stayed away from since. It’s a system used by quite a few manufacturers, BMW included, and one which I find a poor substitute for a properly waterproofed jacket and trousers. There are 2 main reasons for this: Firstly, If you are out in heavy rain the outer jacket allows water to pass through to the waterproof layer which then protects the rider from getting wet. Problem here is that the outer jacket (in most cases) holds the rain water and becomes very heavy and once taken off just drips and drips and drips. You pull over for a warming coffee and leave 2 gallons of rainwater behind when you leave. Secondly. It’s a nice day, you are out for a ride and then … wham, bam thank you ma’am ….. a thunderstorm! You either find somewhere to hide out of the rain but by then you’re already wet, continue riding because you’re already wet or you take off your jacket and get wet trying to insert the dry liner! And it’s even worse if you have trousers using dry liners! Editor’s Reply: This issue was discussed previously in our reviews of “waterproof” jackets. The problem is that there really are no outer jacket shells that we are aware of that are both waterproof and breathable. So the outer breathable shell and inner water-resistant liner system is pretty much the only cost-effective way to go. Tourmaster and others used to make jackets with outer poly shells that were waterproof, but the material did not breathe and became very damp inside in both warm and cold weather. Just about every manufacturer stopped making those. Even the shells with Gore-Tex or other linings bonded to the inner surface are still not waterproof on the outside material, although those types, if made correctly, can work, but are very expensive due to the Gore licensing agreements. As we mentioned previously, one of the most effective solutions is to simply carry a cheap vinyl waterproof outer shell to throw on over the jacket if it starts to rain.